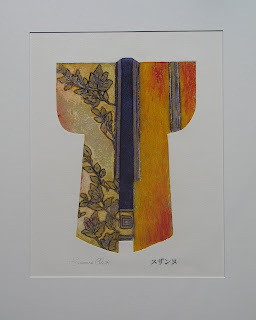 A few years back I began a series of collagraph prints based on the Kimono. It's such a wonderful shape and great to work within. I felt like a dress designer putting these together and could go on and on thinking up new designs. Now that I have my own press I am able to start making them again and yesterday I was in the studio pulling one for a friend when I thought about posting a few here. The Kimonos are signed with my name and the Japanese characters for my name. 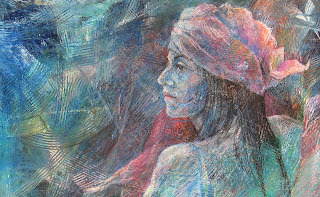 The colors are vibrant and the image is impressed into the paper by the press embossing it which unfortunately doesn't show up in photographs. I have added a detail picture so that you can see a close up. in Roswell north of Atlanta however if you are interested in this one you can contact me or the gallery. I will post more in coming days. 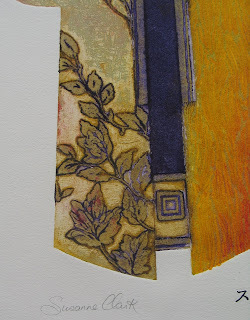 You can also check out my web site http://www.susanneclark.com/ and look on the gallery page for collagraph prints. Here is the latest piece I have been working on. It's a collagraph for an exhibition with the theme "Evolve" starting soon at Heaven Blue Rose Gallery in Roswell, north of Atlanta. 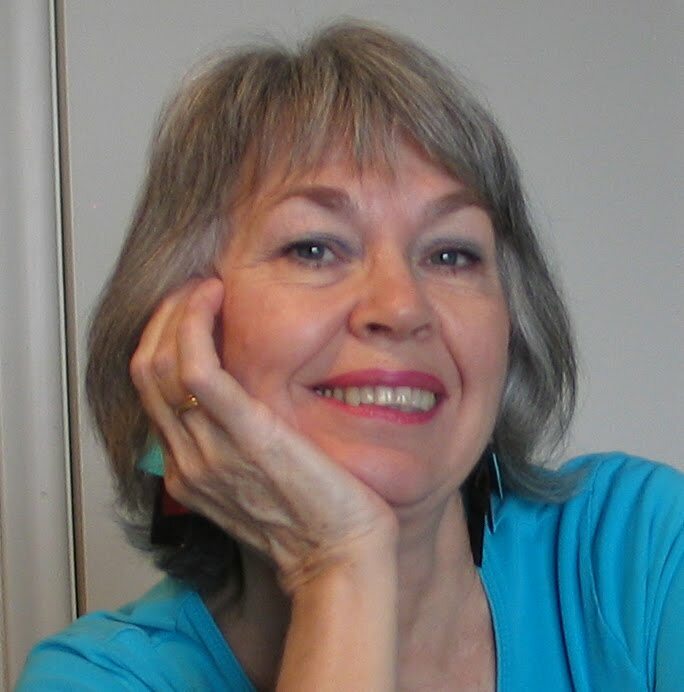 Five basic shapes occur in the art of all cultures; the circle, the cross, the triangle, the square and the spiral. According to a twenty year study by anthropologist Angeles Arrien people in different cultures give similar meanings to these shapes. The circle symbolizes wholeness, the square stability, the triangle dreams and goals, the cross relationship and the spiral means growth and evolution. According to the study, the order of preference in which a person places the symbols, shows which of the five universal processes of change and growth is being experienced most intensely by that person at that time. 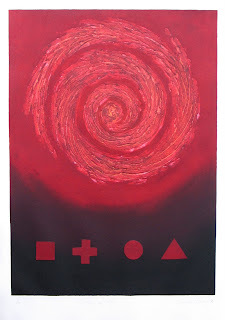 The spiral symbolizes the process of growth and evolution. It is a process of coming to the same point again and again, but at a different level, so that everything is seen in a new light. Well I have gone and done it again! Every time I start a new work I intend to take photos of the process to post on my blog but once again I got into the studio, started working and forgot all about it. Because I am excited about finally having my own press I am focusing on printmaking and trying out a lot of different ideas and techniques. There is an exhibition coming up soon at the gallery in Atlanta where I show my work and the theme is "Evolve" so I am working on a piece with that in mind however I have a friend visiting this week and so I've been busy going out and not doing any work. 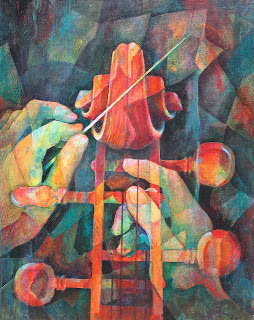 Last week I had notification that I have had two pieces accepted for the "Art of Music" exhibition at Mills Pond House Gallery in Smithtown in NY state. Unfortunately I won't be able to attend the exhibition which is a pity as I would love to see the other musical works being shown. 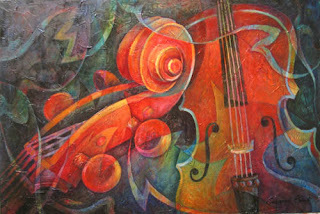 This would be of special interest to me as musical instruments have been my main theme over the past few years. The two pieces being shown are posted below. They are "Dynamic Duo" and "Well Conducted"
Later in the week I will be back in the studio. Yesterday I went to my weekly life drawing group at the Atlanta Artists Center. I really enjoy it especially when the model is interesting as she was yesterday. I like to either just do a charcoal drawing or if I am painting I want to try something different and work in a way I don't usually do. These are my experimental paintings and I am not really interested in trying to make a pretty painting. 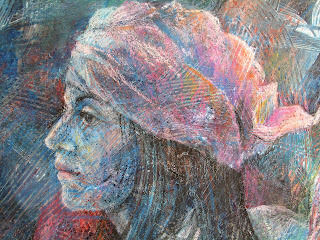 Yesterday I worked in oil pastels on a board that I had painted with the left over acrylic on my pallet. The board was very textured and the paint very random and messy. Most of the colors were primaries so it was very bright. 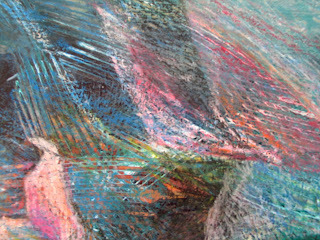 The oil pastels sat up on the textured surface leaving much of the underlying pattern showing. It's certainly not a neat finished looking painting but it was a fun experiment. I will add a couple of pictures showing the detail so you can see the effect. I called it "Looking to the Future"